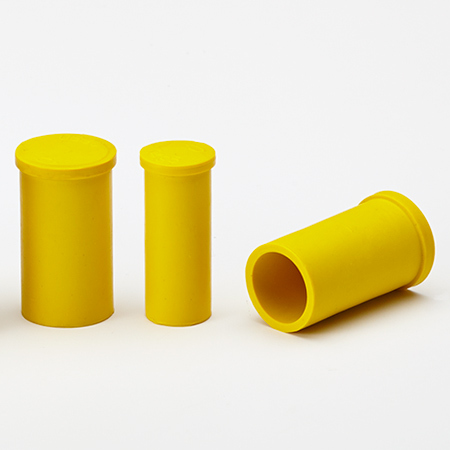 Our Disposable Cap (DC) product line is the most economical alternative for masking or protecting studs in low temp powder coating, liquid top coat and plating operations. Economical enough that the product should be used only one time preventing the need to sort masking after use or demask coated products. Consider leaving caps on for shipping protection as an added value to your customer. Low-Temp Powder, E-Coating, Liquid Top Coat, Plating, Anodizing, Sandblasting and Shipping. When sizing parts as a cap, the ID of the cap should be 2-5% smaller than the stud diameter. 0.372 ID (9.4mm) X 0.488" OD "
0.050 ID (1.3mm) X 0.130" OD "
0.063 ID (1.6mm) X 0.142" OD "